"Is that you coming back to see me? Do you miss me?" American audiences can be so locked in to the Hollywood style of storytelling that we lose sight of the potential of film; and as an audience member, as much as I like a good story well told, sometimes the biggest kick is the jolting sensation of coming out of a movie and asking, "What was that?" 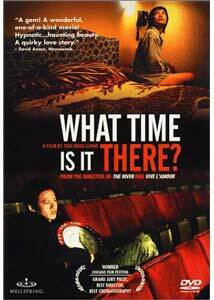 What Times Is It There?, a recent Taiwanese film released here on DVD, definitely falls into the latter category; some of it is very beautiful, occasionally it can be deeply touching, and with some frequency it's little more than shots of empty rooms. There's not much of a hey-kids-let's-put-on-a-show thing happening here, and I'm not convinced that it's as rich with meaning as, say, films by Ozu or Kurosawa, but it offers a good amount of food for thought. Fittingly, given the film's title, the protagonist markets time: Lee Kang-Sheng plays a watch salesman, who hustles his goods on the streets of Taipei. He has dozens in his sample case, but a young woman (Chen Shiang-Chyi) wants only the one on his wrist, with which he is reluctant to part. She is absolutely determined, however, and is leaving tomorrow for Paris, and finally they strike a bargain. He is so taken with their interaction that, though he doesn't see her again, he studies up on all things French (this involves principally a trip to the Truffaut section at the video store), and in one of the film's most manic sequences, he sets every clock he can find in Taiwan to Paris time. In France she's very much a stranger in a strange land, wafting through the third arrondissement, noting the shopping, hungering for a human connection. The young man lives with his mother (Lu Yi-Ching), so deeply grieving over the recent death of her husband that she imagines his spirit returning in any possible form: a cockroach, a fish in the family's tank. Nearly every night mother and son have dinner together, at which she insists on setting a third place, for her departed husband. Her grief turns into a sort of mania, in which she's trying to do that most hopeless but tantalizing of tasks: she wants to recover the past. As the title might suggest, the movie is, about other things, the tyranny of the passage of time, and at its best, it's almost Proustian in its mourning the loss of every passing moment. It's a tremendous challenge to be articulate about the difficulties of communication, but frequently this film is exactly that. The peculiarities of these three central characters don't make them the most endearing figures in film, but the director, Tsai Ming-Liang, has great compassion for these people, and his actors do excellent work, especially in the lingering, long close-ups in which they have no dialogue, in which all we see are their minds at work. But sustaining that tone for close to two hours is a tougher task, and at times you'll find yourself watching a long, ponderous shot of almost nothing—a recently vacated hallway, say—and wonder: just what is this movie? Of course you wouldn't want the pendulum to swing too far the other way, with one of them in Paris, the other in Taipei, turning this into an Asian Sleepless in Seattle; but you may hunger for some redemption coming from their loneliness, or at least the possibility of such redemption. You'll have only your popcorn and Raisinets to slake that appetite, though. The director very much has Truffaut on his mind—not only does his hero watch The 400 Blows, but in Paris, his heroine has a random encounter with Jean-Pierre Léaud, Truffaut's leading man and on-screen alter ego. But the filmmaking style here has little in common with the nouvelle vague, and while some of this movie is deeply moving, much of it seems to exist on such an elevated intellectual plane that it's not always compelling viewing. It's one of those movies that will stimulate every muscle in your body, from the neck up. Image Transfer Review: The palette here is just exquisite, full of fine gradations, which is fortunate, as the production design favors motifs in which a single color fills the frame, with slightly different variations from object to object. (A green rice maker sits on a green table against a green wall, for instance.) Some scratches surface now and again, and they're all the more prominent as so many of the scenes are shot in single takes; there's nothing like an extended master shot to expose the limits of the film stock. But the transfer to DVD is a thoroughly professional one. Audio Transfer Review: There's a certain irony in finding such fine audio detail in a movie whose principal subject is silence, but both of the tracks here are creditable ones. You'll hear more city sounds on the 5.1 track, which ably set the scene in Taipei and Paris, and give a strong feeling of urban life; but both tracks have little or no aural interference, making the lack of noise seem pristine. Extras Review: Tsai Ming-Liang's notes are especially interesting; they're brief, but he discusses writing the script, his actors, and his love of The 400 Blows. There's a filmography for him, as well as for Lee Kang-Sheng; a theatrical trailer and one for home video; and weblinks to Wellspring and to a site devoted to the director. A nourishing intellectual exercise made with a high level of craftsmanship, this movie wavers between being moving on the one hand, and peculiar merely for peculiarity's sake on the other. It's a handsomely presented film on this DVD, and, as its title might indicate, is liable to provoke more questions than answers.